Oasis Academy Bank Leaze is a community primary school in North Bristol. The school was recognised as outstanding for Personal development, behaviour and welfare by Ofsted in 2016. Assistant Principal Clare Kerslake explains how the previous 2014 Ofsted judgement Requires Improvement had prompted senior leaders to introduce Sleuth. “Ofsted was the trigger for us implementing Sleuth. One of our actions was to be more consistent in the management of our behaviour systems. The Ofsted report made us aware that we didn’t know enough about what was going on in some of our classrooms. “Now, as senior leaders, we know exactly what is going on, who is getting what sanctions and how incidents are being followed up by staff. “We are able to show far more easily how we’re managing behaviour and our routines for using information demonstrate we are on top of what’s happening in our school. That’s because we know what’s going on. We can monitor the behaviour across the whole school using detailed evidence rather than just pieces of ad-hoc information and observations. Sleuth is now the way that we manage our behaviour systems. “Consistency is the keyword for us. We have now developed a consistent approach to behaviour management so that our sanctions and interventions are consistent across the school. “Recording the positive behaviour and learning in Sleuth has been a revelation, we’ve embraced that in a big way; we didn’t really have the means to do it before. 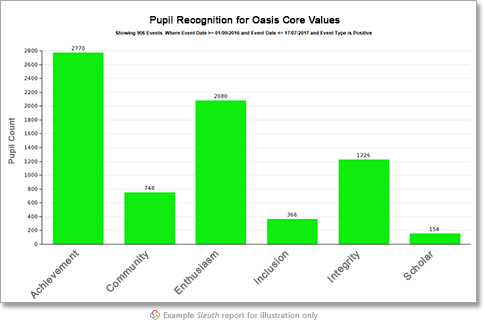 Sleuth provides all the data for our end of term celebration of our values when trophies are awarded to children. During term, we share the house points weekly and pupils absolutely love it, there’s a real house identity. They’re over the moon when their house wins that weekly count. “Another thing Sleuth is really powerful for is requesting support for children from external agencies and complying with statutory assessment requests: it supplies all the data we need. “Ofsted were very impressed by our behaviour; we were able to show reductions of poor behaviour with specific children and in specific classes and demonstrate that we take behaviour very seriously. Not just the high-level stuff but the low-level stuff and what we were trying to do is get the children much more focused on their learning.